How does the minister stay focused on the holy when the daily demands of the church seem relentless? How do we come to a preaching event with a sense that God is working in us and through us? In Preaching that Connects, Charles Bugg and Alan Redditt explore the balancing act of a minister’s authority as preacher, sharing what the congregation needs to hear, and the communal role as pastor, listening to God alongside congregants. How is their message heard and understood? Does the minister know what it is to be a human being and care about congregants as fellow strugglers? 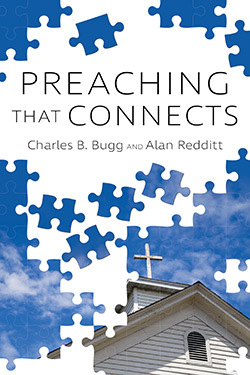 Through conversation and practical step-by-step guidelines, Bugg and Redditt also explore the minister’s connection to the holy, to themselves, and to the texts they hope to bring to their listeners, understanding all the while that preaching is not writing on the blank slates of listeners’ minds and hearts. Charles B. Bugg received his BA from Stetson University and his MDiv and PhD from Southern Baptist Theological Seminary. He has served churches as pastor in Georgia, Florida, and North Carolina. Bugg has held endowed chairs as Professor of Preaching at two seminaries and served as dean and professor of church leadership at the Gardner-Webb University School of Divinity. Bugg is married to Diane, and they have two adult children and one grandson. Alan B. Redditt is the senior pastor of Georgetown Baptist Church in Georgetown, Kentucky. He is a graduate of Georgetown College, McAfee School of Theology at Mercer University, and Duke Divinity School. He is a board-certified chaplain with the Association of Professional Chaplains. Alan has served churches in Georgia, South Carolina, Louisiana, and Kentucky and has served as a hospital chaplain for oncology and palliative care in metro New Orleans.